Last weekend we ventured up to Newport, Rhode Island on a whim! Much to our surprise, the drive from Groton only took us one hour. Newport is a community situated on Aquidneck Island, known for its yacht-filled harbor, delicious seafood scene, Gilded Age mansions, and rich history. The area is known as a summer town, reaffirmed by the thousands of New Englanders who flock there every year. The history of the area is so palpable you can feel it in the air. John and Jacqueline Kennedy were married there in 1953. Presidents Kennedy and Eisenhower made Newport their “Summer White Houses” while in office. The community is also entwined with the Navy, with the Naval War College. The drive to Newport is easy, and the beautiful Clairborn Pell/Newport Bridge, in all its 11,000 foot glory, welcomes you with open arms. If any town embodies New England, this is it. 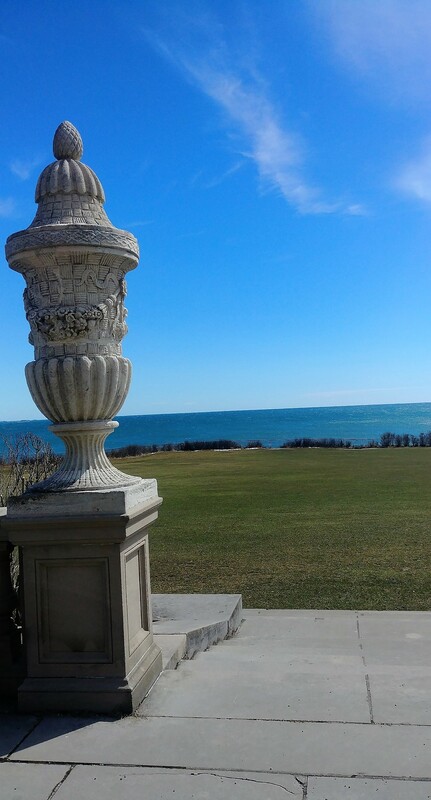 No matter the time of year, no visit to Newport is complete without a stop at the Newport Mansions. These “cottages” are iconic landmarks of the Vanderbilt family. Commodore Cornelius Vanderbilt (1794-1877) established his family’s wealth in steamships and the New York Central Railroad. Just like the other iconic families of the time – the Astors, Carnegies and Rockefellers, these homes were public displays to assert their social and financial dominance. Today, the mansions are strung around New England and open to the public. 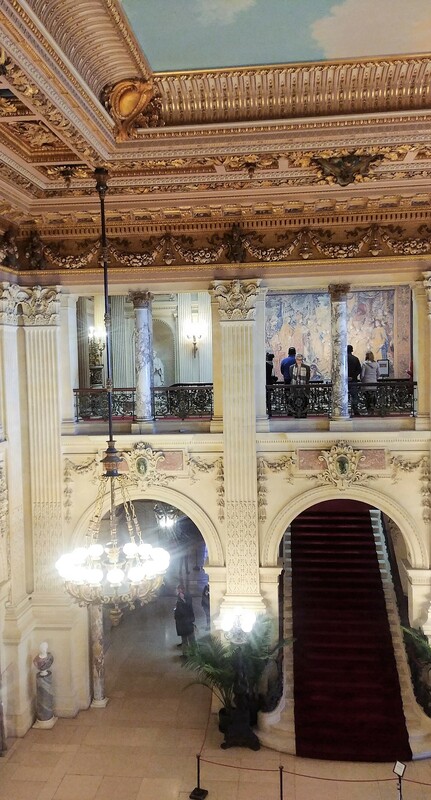 For an easy day trip, we purchased the two mansion pass ($29/person) and toured the Breakers and Marble House. 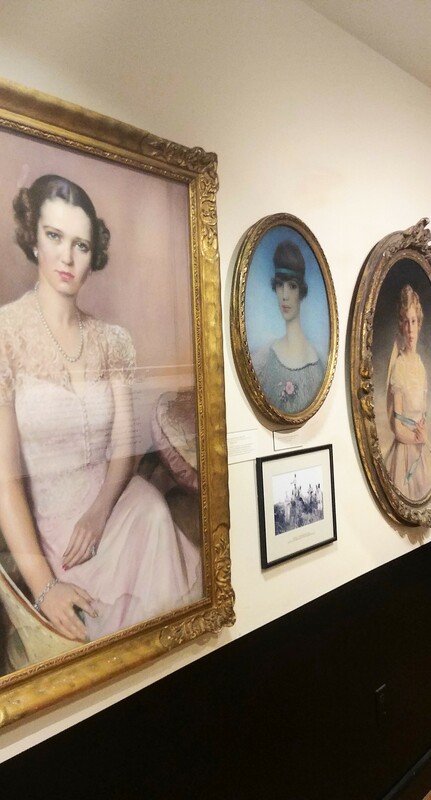 Both mansions provide audio tours that bring the mansions to life, as you weave in and around the elaborate rooms and learn the stories of the men and women who lived there, and the household staff who cared for them. 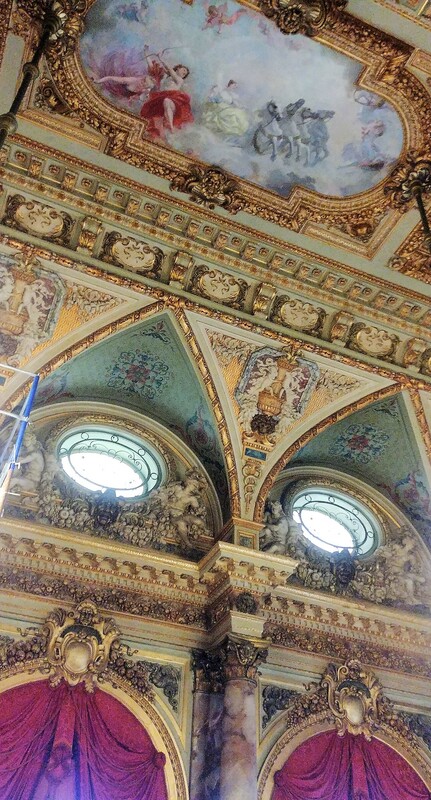 The beauty lies in the details – the dolphin paintings on the walls as a symbol of hospitality, or the elaborate, leather-lined walls of the library, embossed in gold. 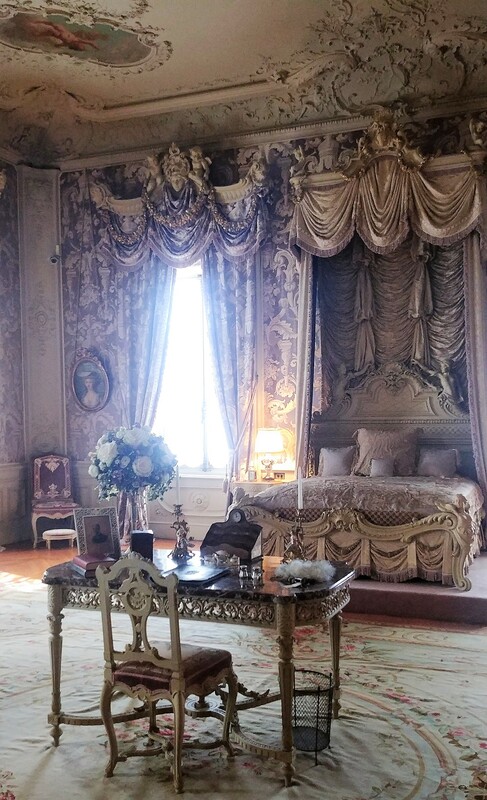 It is a display of exuberant, obnoxious wealth, but the tours give you a true glimpse into the Gilded Age. 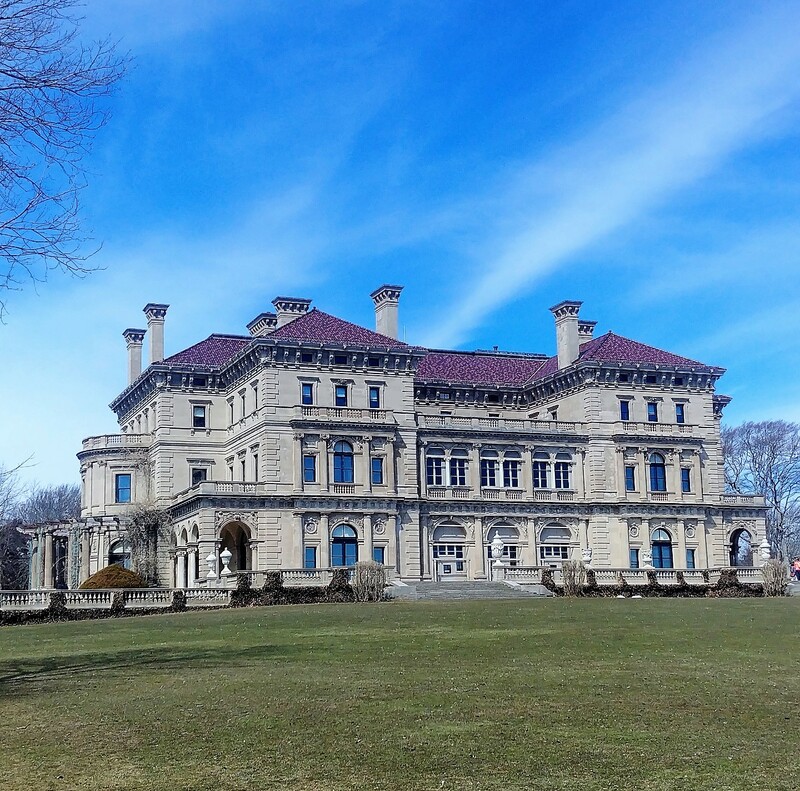 The Breakers is the grandest of Newport’s summer “cottages” and a symbol of the Vanderbilt family’s social and financial standing in turn of the century America. Named after the waves that crashed against the cliffs, the 70-room mansion was inspired by the Italian Renaissance and 16th century palaces. 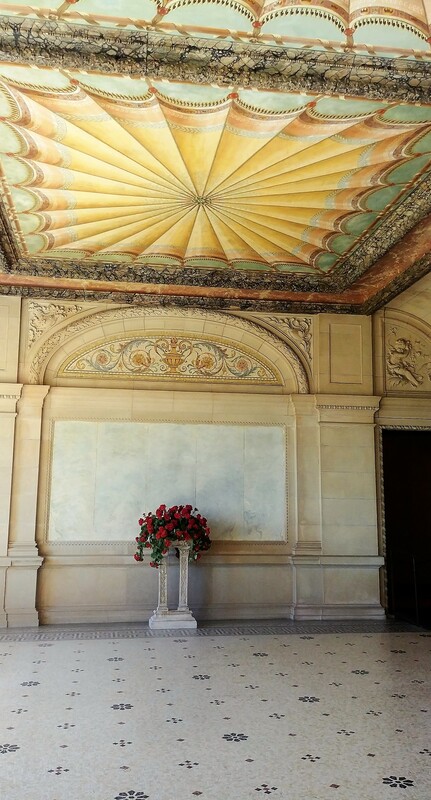 At the time the mansion cost over 7 million dollars, which is equivalent to over $150 million today. 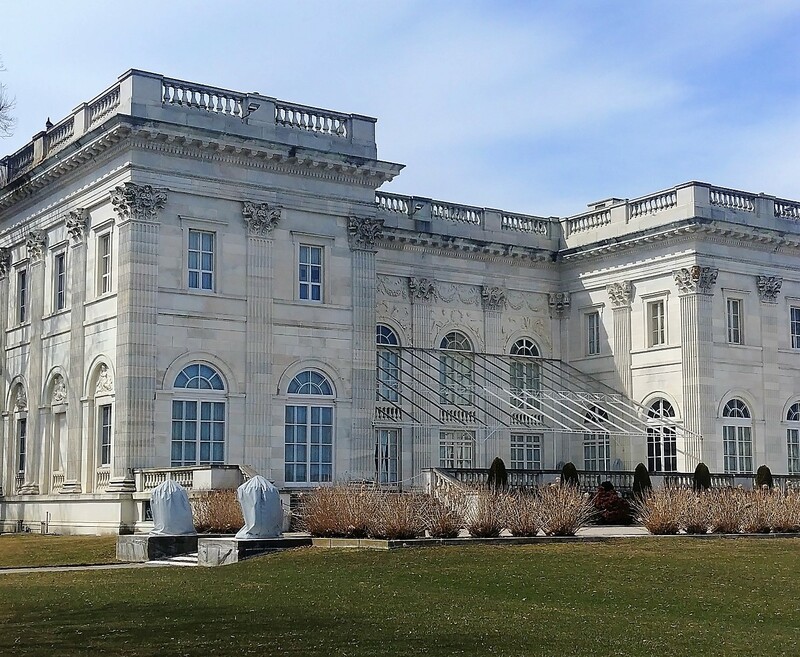 Just down the road, Marble House was built between 1888 and 1892 for Mr. and Mrs. William K. Vanderbilt, grandson of Commodore Cornelius Vanderbilt. 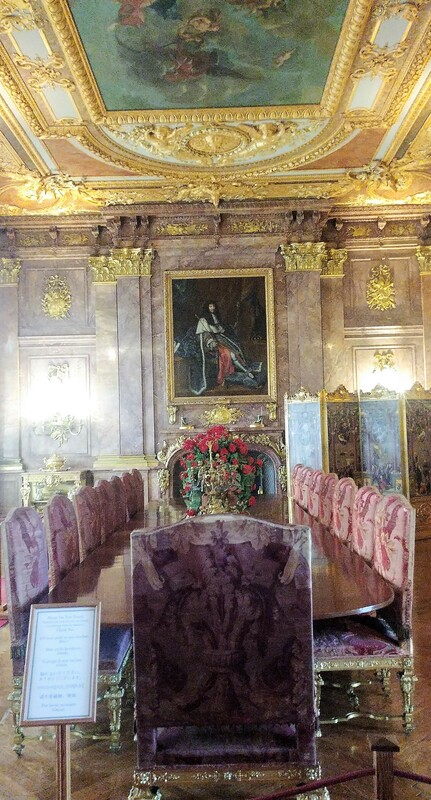 This “cottage” was inspired by Versailles, built with 500,000 cubic feet of marble ($11 million today). The real star of this cottage is Alva Vanderbilt, who divorced William in 1895 and later remarried. 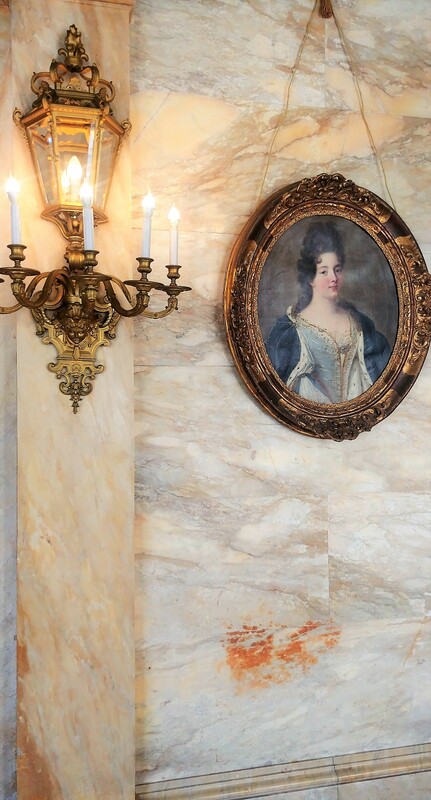 After her husband’s death, she reopened Marble House and hosted rallies for women’s right to vote. She grew to become an iconic figure for the Women’s Suffrage movement. Tips: If you visit during the warmer months ditch your car and explore the area via the Cliff Walk, a 3.5 mile hike that hugs the eastern shoreline. If you visit during the holidays, you can experience the mansions with beautiful and elaborate Christmas decorations. After four hours of touring mansions, we were hungry. And thirsty. We ventured over to Newport’s historic district, with charming, narrow roads and brick lined sidewalks. Our intention was to stop by White Horse Tavern, believed to be the oldest tavern building in the United States (constructed before 1673). Unfortunately the bar was the size of a closet, and the white tablecloths and the stuffy dining room host did not welcome us with much enthusiasm. So we decided to explore the surrounding dive bars! You have to admit, the juxtaposition of our day was hilarious. 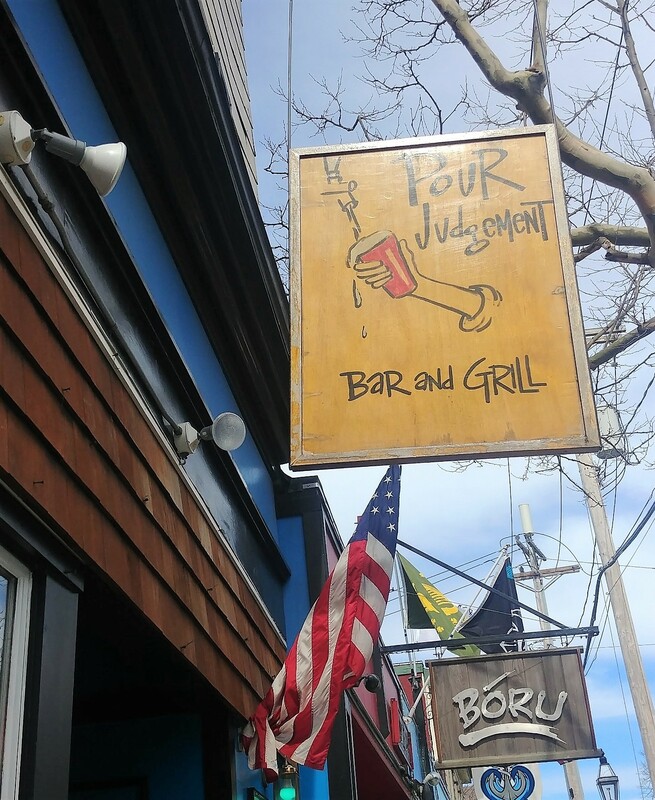 We were lured into Pour Judgement, both by the name but also the impressive crowd inside. The relaxed, narrow pub was lively for a Saturday afternoon, and had everything to love about a dive bar: cheap Christmas lights strung from the ceiling, dark, dusty walls covered in beer stickers and happy, smiley locals hugging each other like it was a high school reunion. 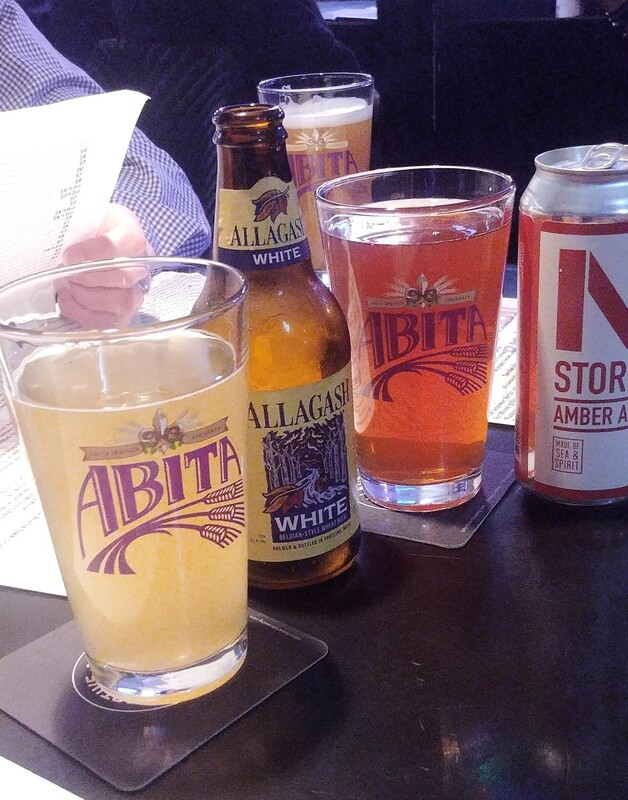 The bar has an impressive tap list of local craft beers and a wildly-eclectic menu. I’m talking tuna sashimi naan bread pizza, Thai shrimp nachos, Guatemalan seafood soup and German sausages. There really is something for everyone, and we loved it all. Other fun stops nearby – the Tavern on Broadway, the Fastnet Pub, and Brick Alley Pub & Restaurant. For more information or itinerary ideas, visit www.discovernewport.org. So that was our day in Newport! We can’t wait to go back with warmer weather, and enjoy some patios, wineries and hikes. Have you ever been to Newport?